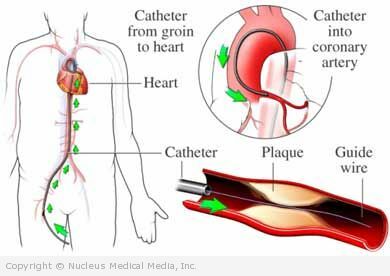 Cardiac catheterization is a test that uses a catheter (tube) and x-ray machine to assess the heart and its blood supply. It is used to find the cause of symptoms, like chest pain, that could mean heart problems. Local anesthesia will be used at the insertion site. A mild sedative may be given one hour before the procedure or through an IV (needle in your arm) during the procedure. This will help you relax. During the procedure, you will receive IV fluids and medicines. An EKG will be monitoring your heart’s activity. You will be awake but sedated so that you will be more relaxed. Your doctor will ask you to do basic functions such as coughing, breathing out, and holding your breath. If you feel any chest pain, dizziness, nausea, tingling, or other discomfort, tell your doctor. The catheter will be inserted into an artery in either the groin or arm (usually at the crease opposite the elbow or at the wrist). The insertion area will be shaved, cleaned, and numbed. A needle will be inserted into a blood vessel. A wire will be passed through the needle and into the blood vessel. The wire will then be guided through until it reaches your heart. A soft, flexible catheter tube will then be slipped over the wire and threaded up to your heart. The doctor will be taking x-ray pictures during the procedure to know where the wire and catheter are. Dye will be injected into the arteries of the heart. This will make the arteries and heart show up on the x-ray images. You may feel warm during the dye injection. Once in place, the catheter can be used to take measurements. Blood pressure can be taken within the heart’s different chambers. Blood samples may also be taken. Multiple x-ray images will be taken to look for any disease in the arteries. An aortogram may also be done at this time. This step will give a clear image of the aorta (large artery leaving the heart). Once all the tests and images are complete, the catheter will be removed. Sometimes, the doctor will do a balloon angioplasty and stenting if he finds an area in your arteries that is narrow or clogged. These procedures help to open narrowed arteries. Cardiac catheterization – How Long Will It Take? The procedure takes about 1-2 hours. Preparation before the test will take another 1-2 hours. Cardiac catheterization – How Much Will It Hurt? Pain medicine will be given when needed. If the catheter was inserted in the groin area, you will likely need to lie still in bed and flat on your back for a period of time. If catheter was in the arm, you will likely be out of bed sooner. A pressure dressing may be placed over the area where the catheter was inserted to help prevent bleeding. It is important to follow the nurse’s directions. Do not drive until your doctor says it is okay. Change the dressing around the incision area as instructed. Your doctor will explain to you which medicines you can take and which ones to avoid. Take medicines as instructed. To lower your risk for further complications of heart disease, you can make lifestyle changes. These include eating a healthier diet, exercising regularly, and managing stress.